A new Israeli orthopedic development provides a solution to a problem which to this day has not been clearly resolved, known as metatarsus adductus (intoeing of the foot in newborns) or by other names addressing the same problem, such as: Pigeon toed, Metatarsus Varus, Metatarsus Primus Varus, Calcaneovalgus, Forefoot Varus, Cavovarus foot,Skewfoot, Intoeing gait or Forefoot Adduction (FFA). We spoke to Eilon Daizade, CEO of UNFO Med. According to him, the solution developed by his father, Dr. Daizade Izak, a senior orthopaedic surgeon, inventor and founder of the UNFO method for the common problem of feet deformities in newborns, is nothing less than a global revolution, since to this day, there has not been a recorded solution to this problem where the foot curves inward. .The first answer was that, God willing, it would work out and everything would be fine. This answer was based on statistical data according to which approximately 80% of mild cases only resolve on their own, with the problem actually having three degrees of severity: mild, moderate, and severe. In most moderate cases, the problem does not resolve on its own, and in severe cases does not resolve at all. One might say that the doctor gambles on favorable statistics tending toward mild cases, while incorporating the rest of the cases (moderate and severe) under the definition of a mild case, and this when even in mild cases, 20% remain unresolved, and although he has no way of knowing which child will do well and which child will not, he chooses not treat them. A second solution parents were offered was to attend home physiotherapy. This placed the responsibility on the parents, and no research exists proving this to be a serious and valid solution backed by clinical research. Worse, this course of action may make parents feel bad for not having done the ‘right thing’ and feel guilty for not providing their child with proper care. The third solution offered is treatment with casts for about two months, with change to reverse-last shoes for several months afterwards, only after attaining the correctional achievement, with the intent to preserve the correction. . It is important to emphasize that a reverse-last shoe alone does not correct the deformity but is intended solely for preserving the achievement attained by the use of the casts so as to prevent regression. This is an exhausting and difficult treatment. The treatment is strict and includes casting to thigh height, which leads to aesthetic, hygienic and other implications. It is a very outdated method, and no proper solution to the problem has been found. 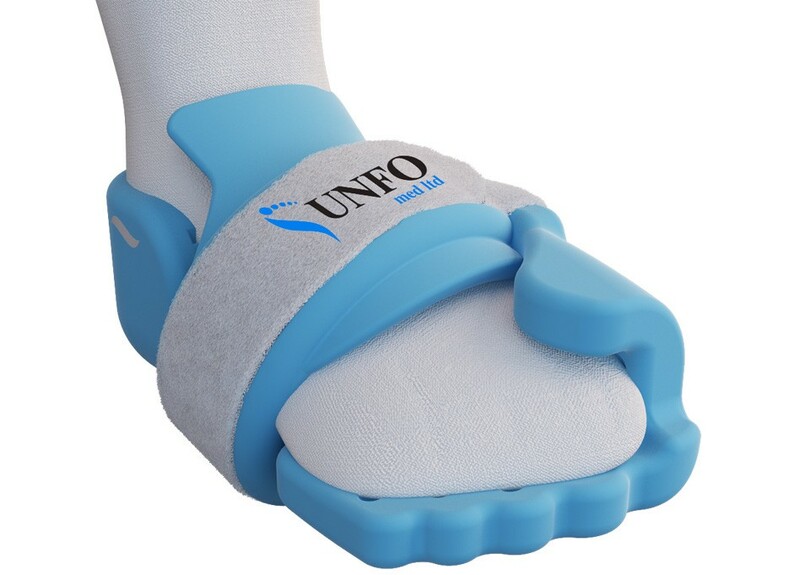 The solution presented by UNFO is a device resembling a shoe which is placed on the foot and which induces a kind of inner massage that affects the skeletal structure and joint of the foot slowly and continuously. The average treatment time is 23 hours a day for 6 weeks, followed by an additional 6 weeks at night only (12 hours a day), depending on the degree of severity. In addition, 90 percent of the time is dedicated to preserving the achievement obtained during the first 14 days, and unlike the cast treatment, there is no need to have the casts replaced by a specialist every two weeks, thereby avoiding related problems. Daizade stresses that the problem to which he is referring is highly common and concerns an average of 8 feet per every 100 births, and he believes it is important to inform the parents and make them aware of this solution. The development as a whole began about seven years ago, but the procedure has been launched only this past year, after having undergone tests and approvals, as well as extensive clinical studies at Hadassah Hospital in Jerusalem, Israel and at Rizzoli Hospital in Italy, which yielded positive results of a success rate of near one hundred percent. These studies will soon be published worldwide. He adds that to date, the success rate is near one hundred percent; with some infants not achieving positive results due to starting the treatment at a later stage, past the most effective treatment time window during which the problem is at all treatable – that time window being an average age of 9/10 months. At a later age, results are more difficult to discern because the foot has hardened and set.